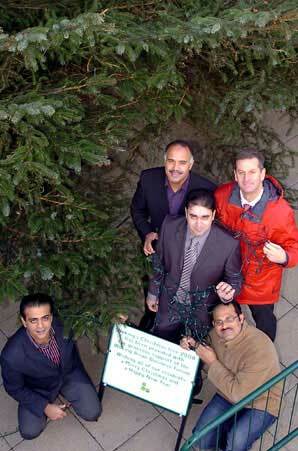 THE Woking Asian Business Forum (WABF) has donated a 40-foot Christmas tree to the town for everyone to enjoy this festive season. The forum officially handed over the sitka spruce to the community on Tuesday. There had been a delay in its arrival in the borough after the trunk of the original tree that was chosen became split. A replacement had to be chosen at short notice from a forest in Northumberland. But luckily for Woking’s shoppers, Town Square is all set for the festive season and the Christmas tree has been decked out with twinkling fairy lights. Shahid Azeem, chairman of the WABF, said: “We are absolutely delighted to be donating the Christmas tree to the town centre this year. When the decorations come down in the new year, the tree will be chopped up and chipped so that the wood can be recycled and reused.